Gandona, as my grandfather was known to villagers, was a man of compassion and kindness. His means were slightly more than most, and he earned a reputation for his kind deeds and loaning of money to those in need. He was nicknamed Gandona, which in English translates loosely to “humble man”. Eventually my grandfather became too old to work the farm and he moved to the nearby village. After he passed away in 1974, the Quinta was sold. 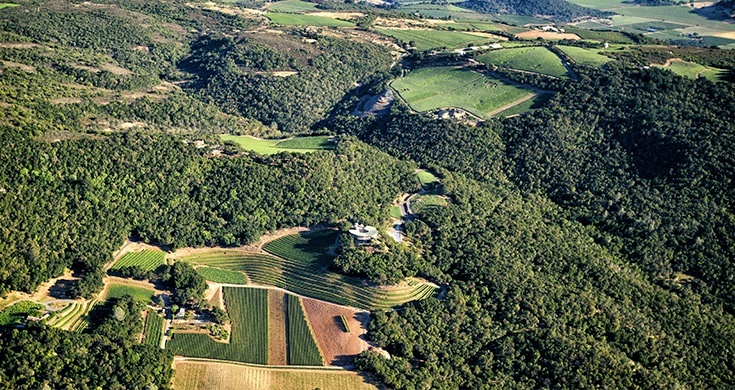 A few years later, wildfires damaged a large portion of the property, but the old vineyard was left unharmed. In 2009, my wife Cristina and I reacquired the Quinta and began its restoration. As a child, I spent summers on my grandfather’s farm in the Douro region of Portugal. The school year couldn’t end fast enough so I could return to my life there. The farm was named “Quinta Fraga do Arco” after the unique arched rock formation that has graced the property since pre-historic times. We grew grapes and olives which were sold to nearby villages. The Quinta’s rolling hillsides were covered in vegetation that became fragrant and aromatic with the warmth of the sun, and the surrounding countryside was a patchwork of crops from neighboring Quintas, framed by the curves of mountains. It’s funny how life seems to come together as if it were a building being assembled brick by brick. My childhood experiences at the Quinta, a good education, success in the business world, and starting our family, have led me to where I am today. When we found the Pritchard Hill property for Gandona Estate in 2006, the time was right to begin the life I had been dreaming about since my summers on the Quinta. Our daughters were young adults and living away from home, and our son had just finished eighth grade so moving him would be less traumatic than after he entered high school. “Honoring tradition is an important aspect of the wine industry. In Europe, skill, knowledge, land and values are passed down from generation to generation, creating a rich history. Wine families dedicate their lives to maintaining the family business and to continuing its heritage. In starting Gandona Estate, we see what we hope is the birth of our own legacy, and in a small way, the continuation of the legacy of Gandona. It was important to both Cristina and I to incorporate a touch of Portugal into Gandona Estate. Following the path set by my grandfather, we planted a small block of Touriga Nacional to produce an authentic Port-style wine. Indigenous to Portugal, the varietal is regarded as the finest and most widely used grape for the production of Port, and is well-suited to the heat and rocky hillsides replicated here on Pritchard Hill. Notoriously difficult to grow, and yielding only tiny-sized berries, the grape compensates by producing intensely aromatic grapes with rich flavor.